Keith Heiniger was born on November 29, 1931, in Seneca, Kansas. He was commissioned a 2d Lt in the U.S. Air Force through the Air Force ROTC program at Kansas State College on May 23, 1954, and went on active duty beginning June 22, 1954. Lt Heiniger next attended pilot training and was awarded his pilot wings at Laredo AFB, Texas, in July 1955, followed by the Intelligence Officer Training course at Sheppard AFB, Texas, from July to September 1955. His next assignment was as an Intelligence Officer with the 334th Bomb Squadron at Biggs AFB, Texas, from October 1955 to July 1956, and then Jet Qualification training at Craig AFB, Alabama, from July to September 1956. He attended the Fighter Gunnery course at Luke AFB, Arizona, from September 1956 to March 1957, and then served as an F-100 Super Sabre pilot with the 493rd Fighter-Bomber Squadron at Chaumont-Semoutiers AB, France, from March to September 1957. Capt Heiniger served as a Photo Intelligence Officer, Intelligence Officer, Assistant Operations Officer, and Chief of the Standardizations Division with the 815th Operations Squadron at Forbes AFB, Kansas, from October 1957 to May 1962, followed by an Air Force Institute of Technology assignment to complete his master's degree in Geodetic Science at Ohio State University from June 1962 to May 1964. His next assignment was as a Geodetic Survey Officer and then Chief of the Geodetic Computer Branch with the 1381st Geodetic Survey Squadron at Orlando AFB, Florida, from May 1964 to July 1965, and then as Chief of the Geodetic Computer Branch and Chief of the Data Control and Analysis Branch with the 1381st Geodetic Survey Squadron after it moved to Francis E. Warren AFB, Wyoming, from July 1965 to August 1966. Maj Heiniger next attended the F-100 Operational Training Course with the 522nd Tactical Fighter Squadron at Cannon AFB, New Mexico, from August to November 1966, followed by Airborne Forward Air Controller training at Eglin AFB, Florida, from November 1966 to January 1967. He then served as an O-1 Bird Dog forward air controller at Kontum AB, South Vietnam, from January to May 1967, and at Dong Ha AB, South Vietnam, from May to July 1967. His next assignment was as an F-100 Super Sabre fast forward air controller with the Misty Fast FACs at Phu Cat AB, South Vietnam, from July to November 1967, followed by service as an O-2 forward air controller with the 20th Tactical Air Support Squadron at Ubon Royal Thai AFB, Thailand, from November 1967 to February 1968. During this time, Maj Heiniger flew 376 combat missions throughout Southeast Asia. After returning from Vietnam, Lt Col Heiniger served as Chief of the Data Reduction Division with the 1381st Geodetic Survey Squadron back at F.E. Warren AFB from March 1968 to July 1969, and during this time the unit was redesignated the 1st Geodetic Survey Squadron. His next assignment was as Chief of the Stellar Camera Division with the 1st Geodetic Survey Squadron from July to October 1969, followed by service as a Geodetic Operations Staff Officer with Military Airlift Command at Scott AFB, Illinois, from October 1969 to January 1971. Col Heiniger served as Commander of the Geodetic Survey Squadron, now renamed Detachment 6 of the 1146th Special Activity Squadron, at F.E. Warren AFB from January 1971 to February 1976, and then served as Director of Operational Intelligence with Headquarters U.S. Air Forces in Europe at Ramstein AB, West Germany, from February 1976 until his retirement from the Air Force on March 1, 1977. After retiring from the Air Force, Keith worked for the Wyoming Department of Transportation as a pilot and retired from State service in 1999. He died on January 10, 2015, and was buried at the Seneca City Cemetery in Seneca, Kansas. Keith Heiniger was Misty 15. 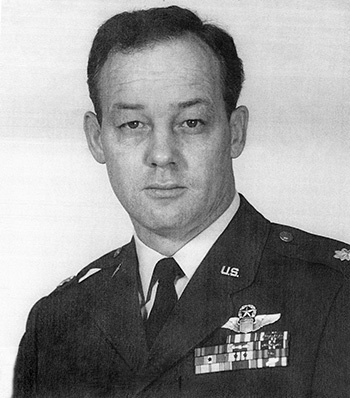 Major Keith D. Heiniger distinguished himself by gallantry in connection with military operations against an opposing armed force while acting as a Forward Air Controller over North Vietnam on 28 July 1967. On that date Major Heiniger controlled multiple air strikes against a hostile convoy heavily defended by antiaircraft artillery. Despite low cloud conditions and with complete disregard for his own personal safety, Major Heiniger repeatedly flew through withering barrages of antiaircraft artillery fire to deliver his marking rockets on target. On four separate marking passes Major Heiniger accurately marked the target thereby enabling strike fighters to completely destroy the target. By his gallantry and selfless devotion to duty, Major Heiniger has reflected great credit upon himself and the United States Air Force.